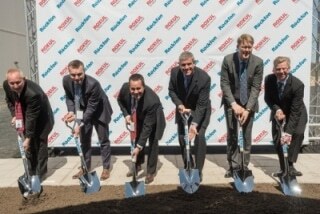 ROXUL® USA Inc. affiliate ROCKFON® LLC, a subsidiary of Denmark-based ROCKWOOL® International A/S, officially broke ground today on its first North American acoustic ceiling panel manufacturing facility. Speaker of the House Philip Gunn, Mississippi House of Representatives, was in attendance to celebrate the milestone with ROCKFON, ROCKWOOL and ROXUL executives, their customers, industry stakeholders, and community leaders. "ROCKWOOL remains steadfast in its commitment to the North American marketplace," says ROXUL USA President, Trent Ogilvie. "The investment in this new facility is a testament to the rising demand for mineral wool products. ROCKFON's line of mineral wool acoustic ceiling products are best-in-class, and with this manufacturing site set to extend global capacity, it paves the way for further growth and innovation." The new 130,000 sq. ft. ROCKFON facility––ROCKFON's fifth in the world––represents an initial investment of approximately $40 million by ROCKWOOL International A/S. In North America, ROCKWOOL has been operating under the name ROXUL since 1988. "Today is a great day for Marshall County as ROCKFON prepares to begin construction of its new acoustic ceiling tile facility," says Mississippi Governor Phil Bryant. "Once complete, the company's significant investment and creation of 90 new jobs will have a strong positive affect on the local community and economy. I congratulate the ROCKFON team and everyone involved in bringing this great company to Mississippi on this milestone event." The new ROCKFON plant will be situated adjacent to the current ROXUL USA factory in Marshall County, Mississippi, which manufactures a full line of residential, commercial and industrial mineral wool products. Production at the ROCKFON facility is expected to commence mid-2017. ROCKFON has been operating in North America since January 2013. With the acquisition of Chicago Metallic® in Oct. 2013, ROCKFON provides customers with a complete ceiling system. Its product offering combines ROCKFON stone wool and specialty metal ceiling panels with Chicago Metallic suspension systems. The new facility in Mississippi will manufacture ROCKFON stone wool acoustic ceiling products. ROCKFON specialty metal ceiling panels and Chicago Metallic suspension systems will continue to be manufactured in its Chicago and Baltimore facilities. Chicago Metallic suspension systems also are manufactured in Belgium, Malaysia and China. ROCKFON's other stone wool manufacturing facilities are located in the Netherlands, Poland, France and Russia.